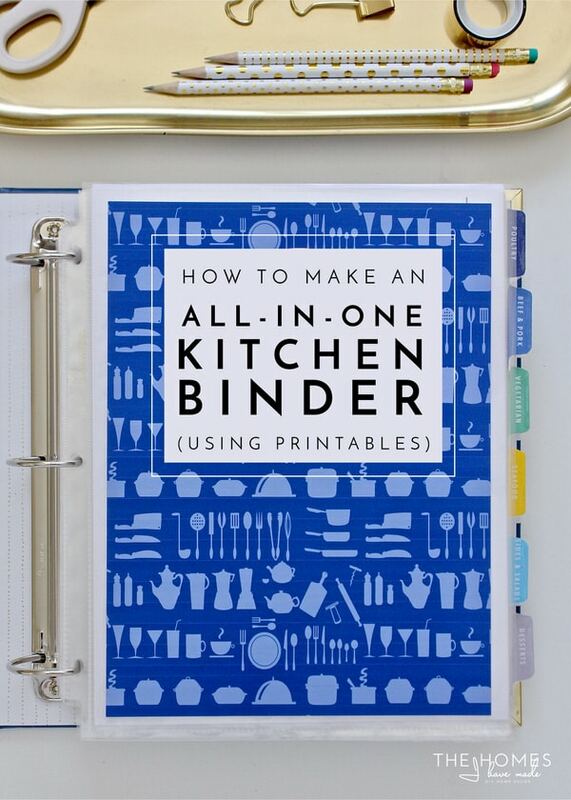 Last week, I was over at my friend Laura’s site (I Heart Planners) giving a tour of my All-In-One Kitchen Binder (see the tour here). This binder is the result of years of refinement of my recipe organization and meal planning processes. 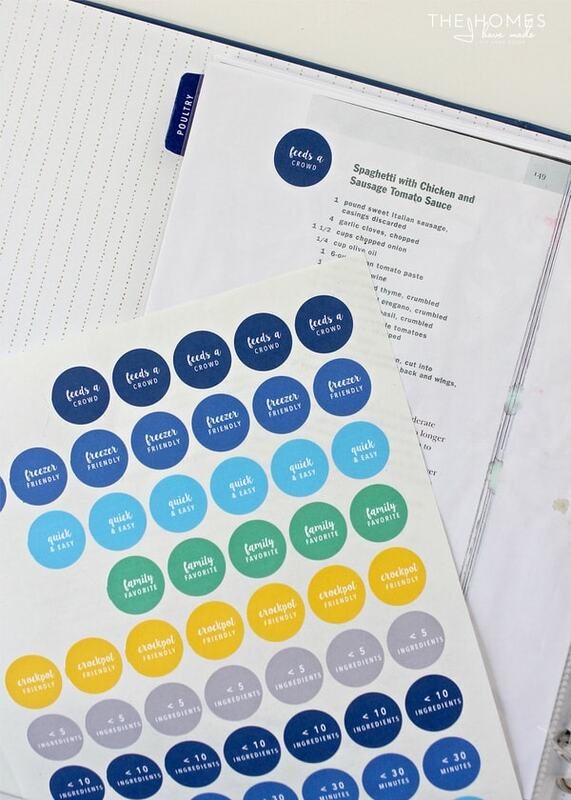 My desire to make meal planning, grocery shopping, and dinner prep as simple and efficient as possible is what ultimately lead me to create all the worksheets and printables in The Ultimate Kitchen Printable Pack, and I am so excited to (finally!) 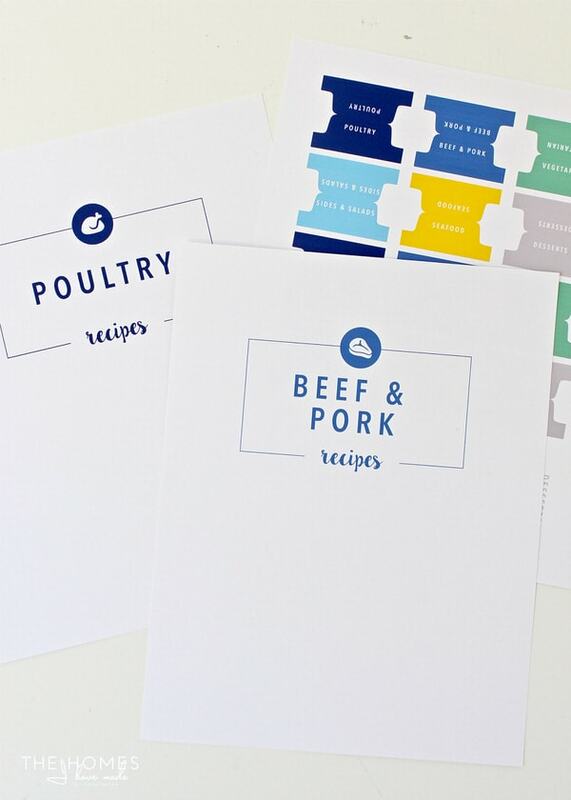 show you how to take these printables, print what you need, and assemble them into a one-stop-shop for everything meal related. 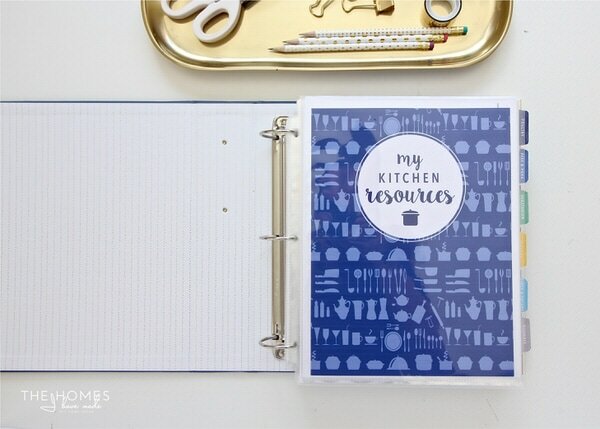 I am beyond smitten with the functionality of this Kitchen Binder, so let me show you how to put one together! Last Fall I shared with you all the various reason I can’t quite quit meal planning. Although it’s a task I don’t particularly like, I’ve found our household hums along a little better when I do it. Because I find it necessary but don’t enjoy any minute of it, I have spent years trying to make our meal planning and grocery shopping as quick and easy as possible. Six years ago, I created the Magnetic Menu Board system. It worked great for years; but when it became too burdensome for our family, I simplified the system and relied more on my Recipe Books. In the last few years, the collection of 7 different recipe books were functioning fine but still felt a bit clunky when it actually came time to sit down and do meal prep. I was constantly hopping up to grab another book in order to hunt down a different recipe, and I found myself pining for everything all in one spot. 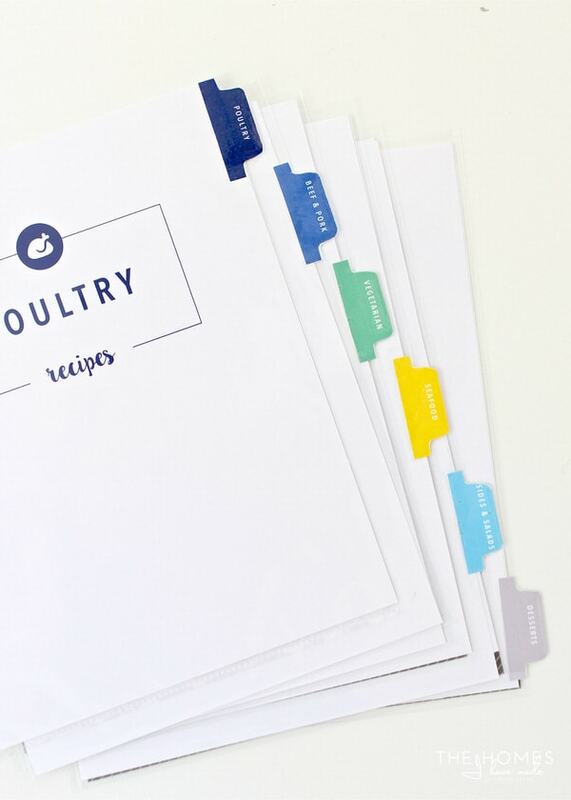 From recipes and food inventories to various labels, meal plans, grocery lists and more, I now have everything I need to plan our meals, create our grocery lists, and prepare dinners in one tidy (and pretty!) spot! 2-3″ Binder – Any binder will do. 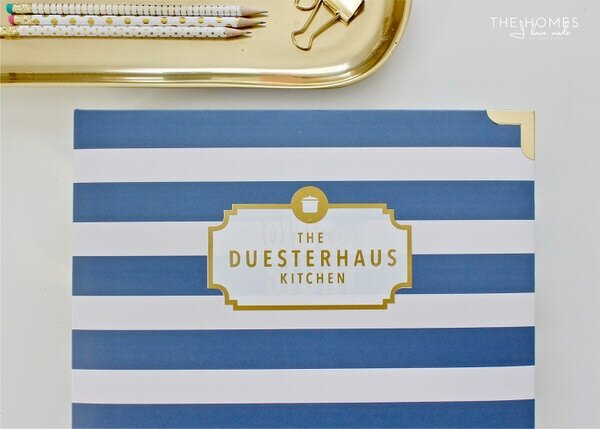 I found this pretty blue-and-white striped binder on clearance at Michaels. I provide various printable binder cover options, so one with a clear pocket front is also a good choice! Page Protectors – Buy as many as you think you’ll need for your amount of recipes. I bought a box of 100 and have about 20 leftover. 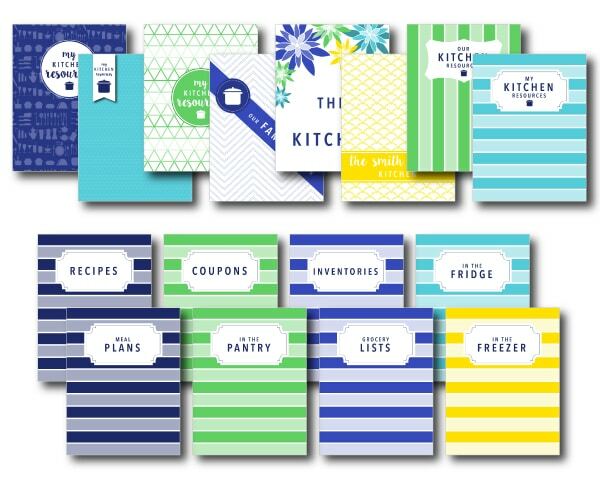 Kitchen Printables: (Optional) Pick and choose the printables you like and need from The Ultimate Kitchen Printable Pack! Yep. All of them. 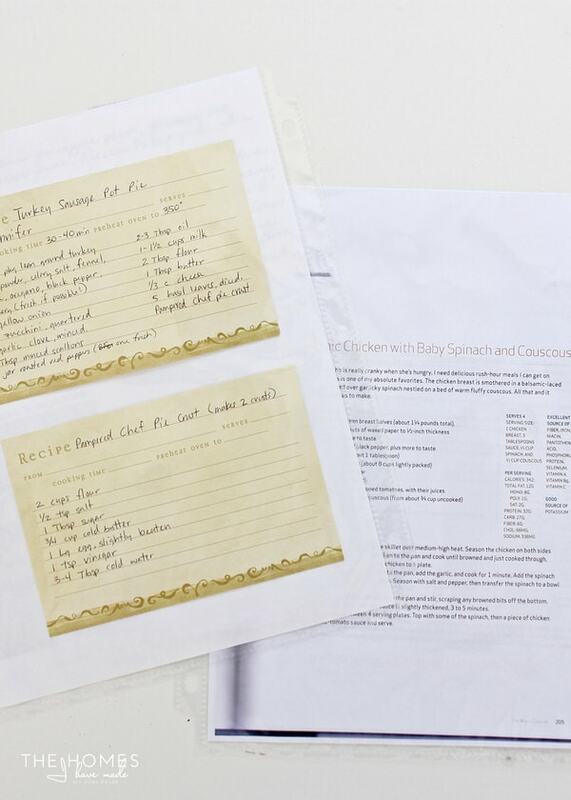 Print them off the computer, dig them out of your recipe card box, copy them out of your favorite cookbooks. 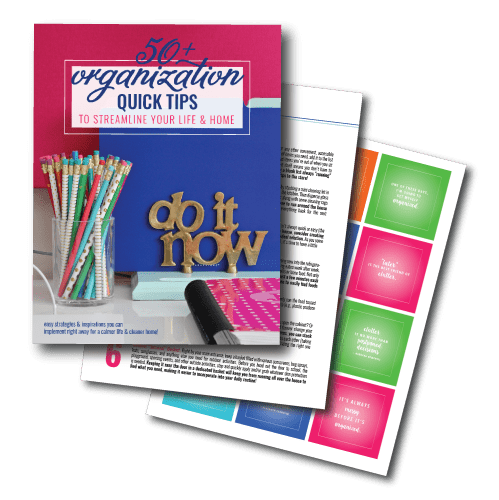 If you need to transfer recipes to recipe cards, I have both half-page and full-page recipe sheets available in the Recipe Organization Kit, as well as The Ultimate Kitchen Printable Pack. You can certainly pick different categories if you like. However, I have found that these 6 categories prove to be very intuitive, and using just 6 keeps the whole system relatively simple. Plus, all my printables are designed around these 6 categories, making this whole project print-and-go once you get to the assembly stage 😉 While you are sorting, go ahead and toss any recipes you don’t like or make. Part of making this system efficient is clearing away the noise and finding those recipes you love or make most often. 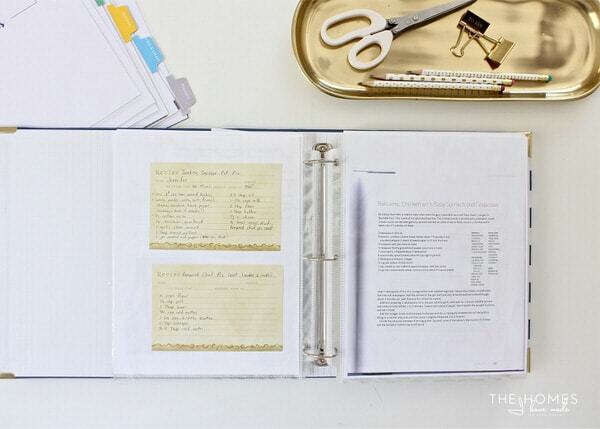 Once your recipes are sorted and purged down, load them all into page protectors. For any recipe that is already on a full single sheet, load it directly into the page protector. 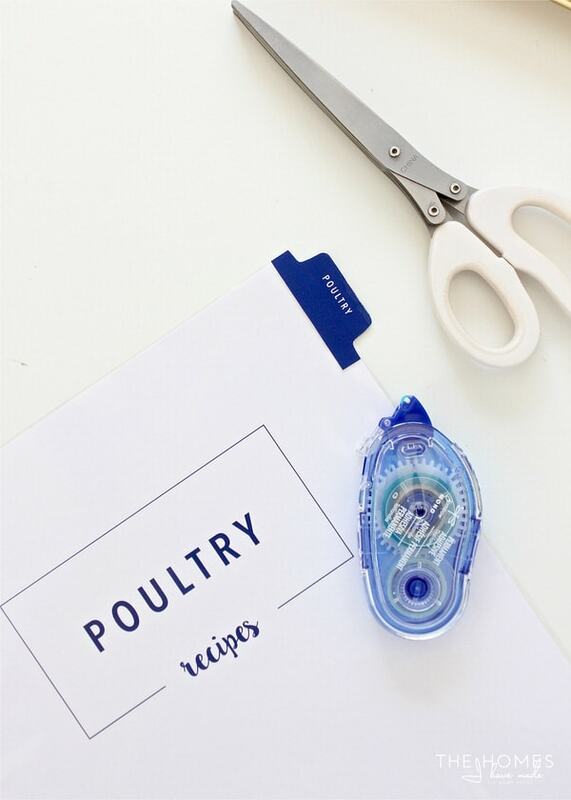 For recipes on cards, clipped from magazines, or scratched onto small pieces of paper, tape them onto sheets of white cardstock before loading into page protectors. Tip: If you need to be able to read the back of a recipe card, only put tape on the left side of the card as you secure it to cardstock. 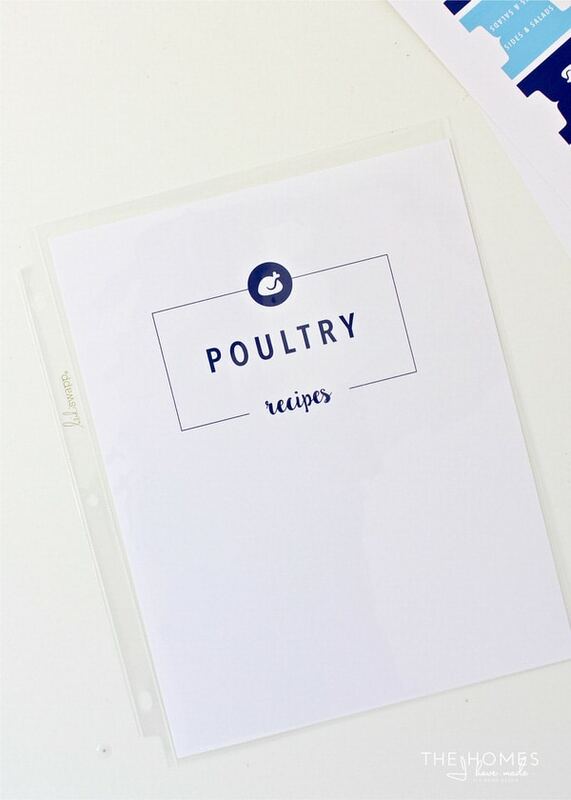 When making a recipe, it is easy to slide the cardstock out of the page protector and flip the card over. If you have a lot of (and cook from) recipe cards, you might want to consider loading them into page protectors designed for recipes instead! 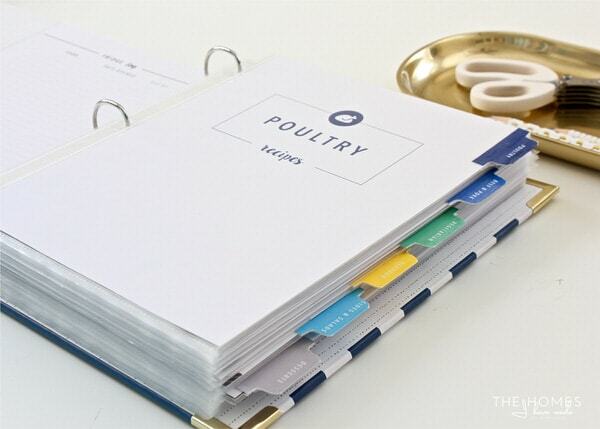 Now that your recipes are sorted and protected, load all the page protectors into your binder keeping the categories together. 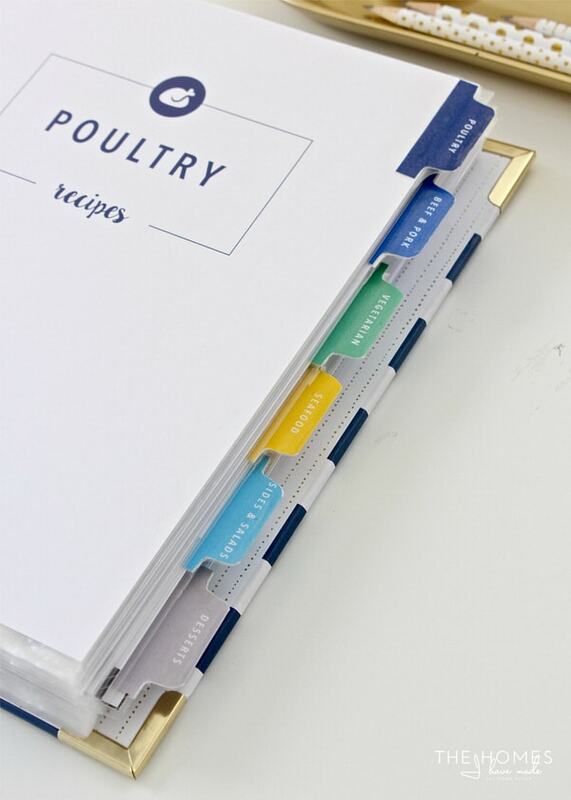 So that you can easily add new recipes as you discover them, put any empty page protectors in the back of the binder. The main adjustment from my old Recipe Books to this All-In-One Kitchen Binder is that everything is now in one binder (obviously). Although I want everything together, I still need to be able to quickly and easily find the right recipes, so it’s important to make dividers for each recipe category. Start by sliding the recipe category pages into the page protector. Then, trim down the tabbed dividers you want with a scissors and fold in half. 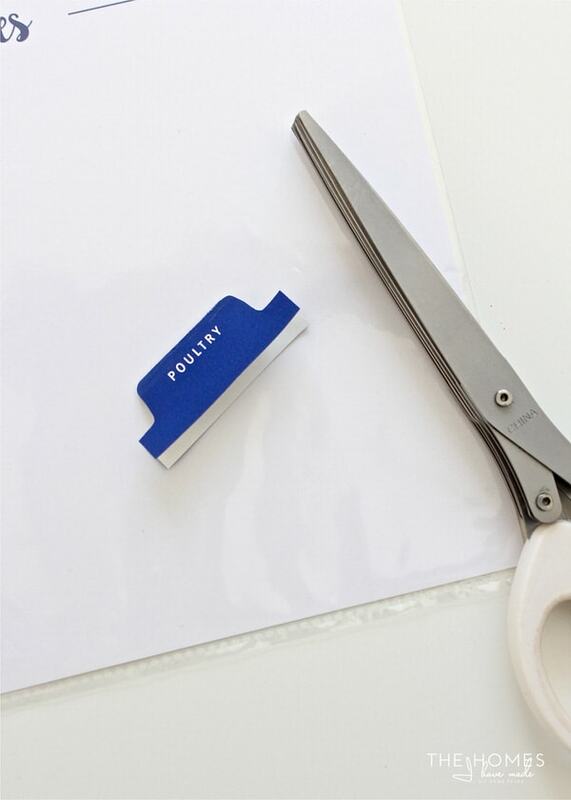 Secure the tab to the edge of the corresponding page protector with roller adhesive. For added durability and protection from kitchen splashes and spills, consider folding a piece of clear packing tape (or clear contact paper) over the tab and trimming around the tab to cut away the excess. 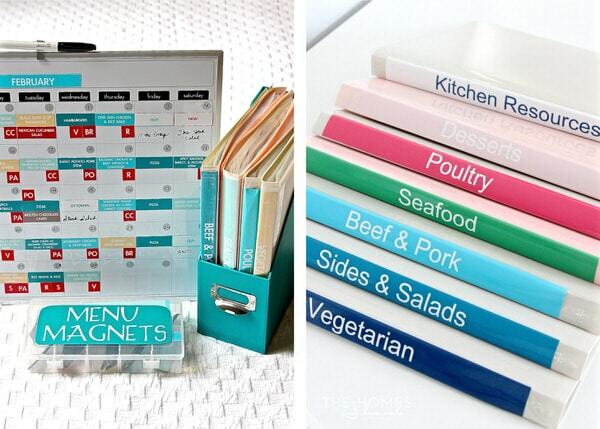 …and then load them into your binder to separate out each recipe category. 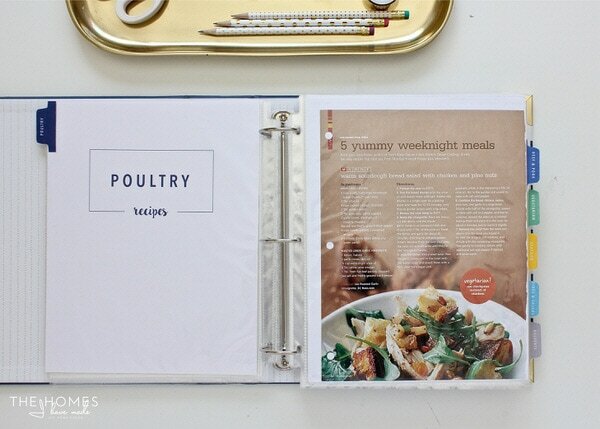 I highly recommend printing and filling out a recipe inventory for the front of your binder. 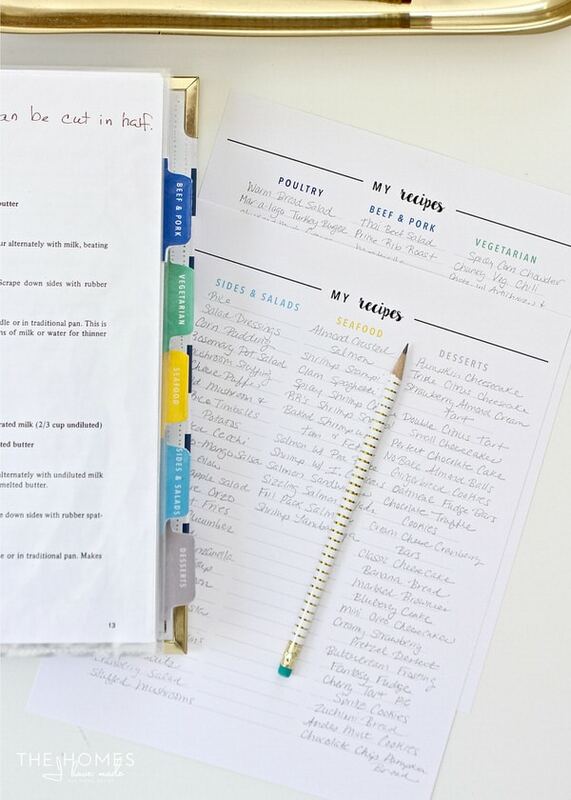 Having an at-a-glance snapshot of all your recipes makes filling out a meal plan SO MUCH EASIER. (Sorry for shouting, but seriously.) 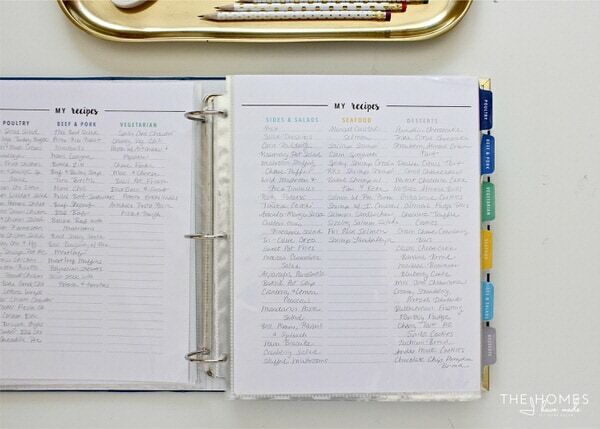 Instead of having to flip through pages and pages of recipes to fill out a meal plan, these lists can help you see all your recipes and even remember ones you haven’t made in a while. I have 5 different recipe inventory layout options available in the printable pack, but I like the 3 category/page layout the best. With this tool, it’s very easy to make sure you have a spread of recipe types across your weekly meal plan…just pick a recipe from each column! To create a recipe inventory, select which recipe inventory layout you like best. Print it single or double-sided (depending on how many recipes you have), and then fill it out (with pencil, so you can easily remove recipes as you need to). In addition to all my recipes written out by categories, I also like to keep a separate list of our freezer-friendly and crock-pot friendly recipes. 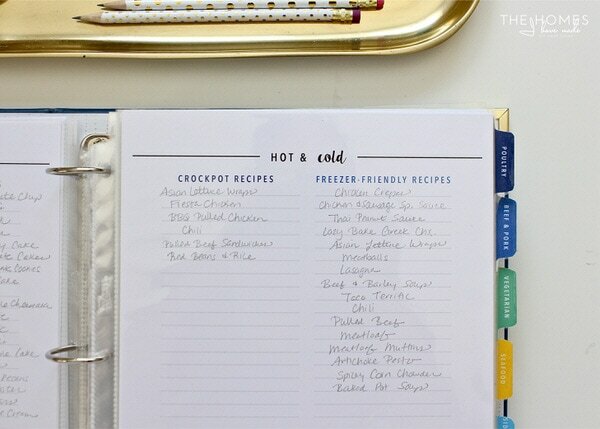 Instead of trying to remember which recipes on my master list can be frozen or made in a crockpot, this list allows me to quickly see my options when I need them on our weekly meal rotation. 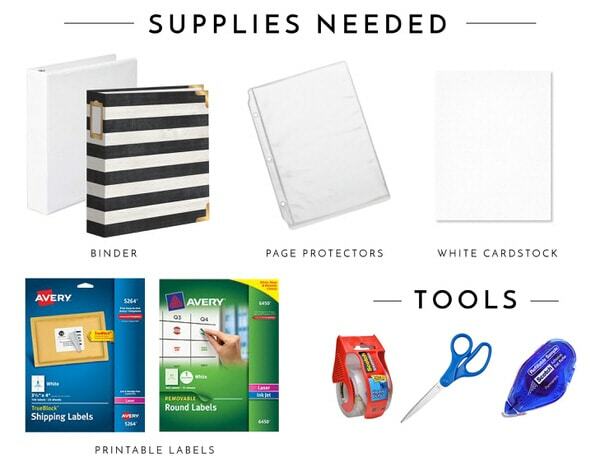 Once printed and filled out, load these inventories into page protectors and place in the front of your binder. There is a reason I am calling this my All-In-One Kitchen Binder rather than an All-In-One Recipe Binder. I wanted this binder to include absolutely everything I need and use to keep our kitchen stocked and put meals on the table. So in the front of all my recipes, I included a section for various Kitchen Resources I use and reference all the time. 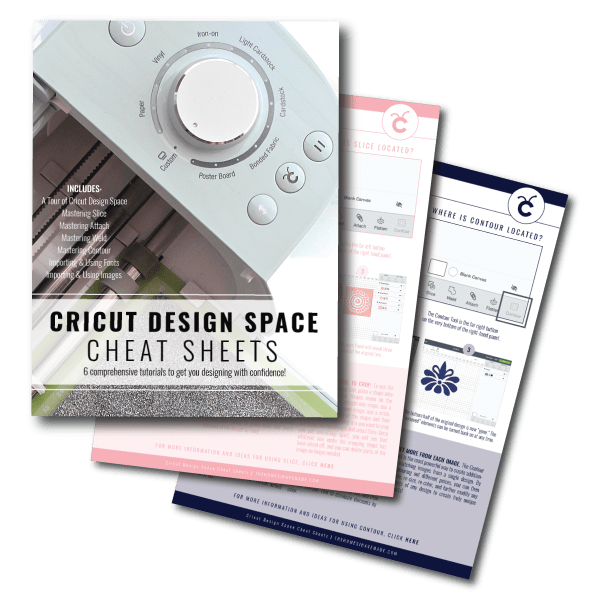 When desinging The Ultimate Kitchen Printable Pack, I wanted something that offered ultimate functionality yet easy personalization. 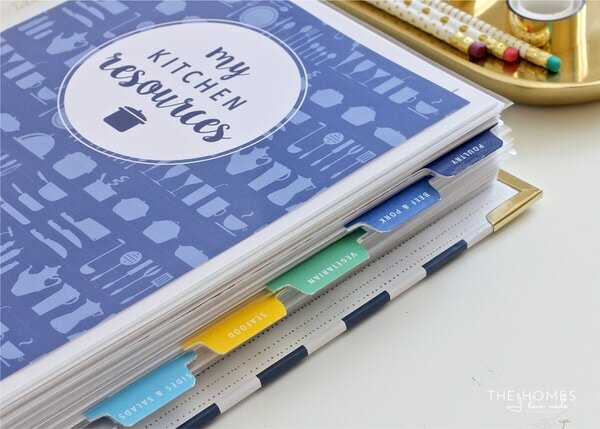 As such, I created every kitchen inventory, recipe card, label and worksheet in every layout you can imagine. But the best part? You don’t need to print and use them all! 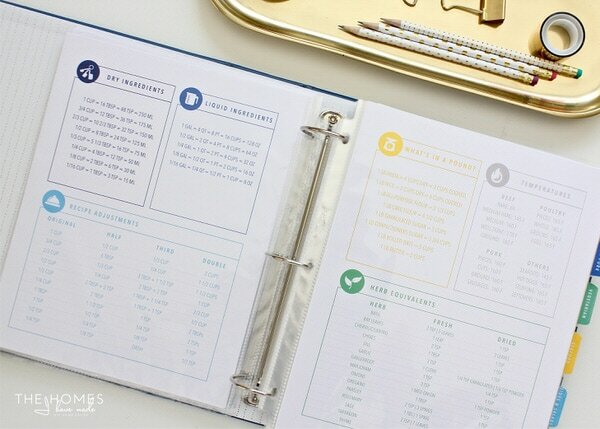 You can test out the various meal planners until you find the one(s) you like best. 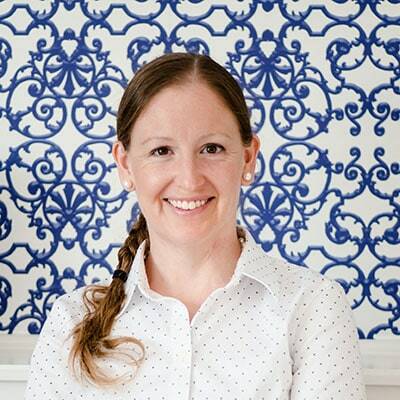 You can inventory your recipes, pantry, spices, refrigerator and freezer any way you want. Or not at all. 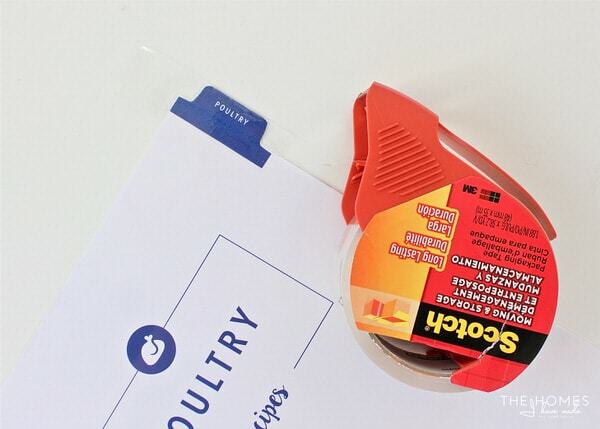 You can print and try one grocery list and then try another until you find the right one. I only printed off the printables that make sense for me and my family…want to see which ones I use? 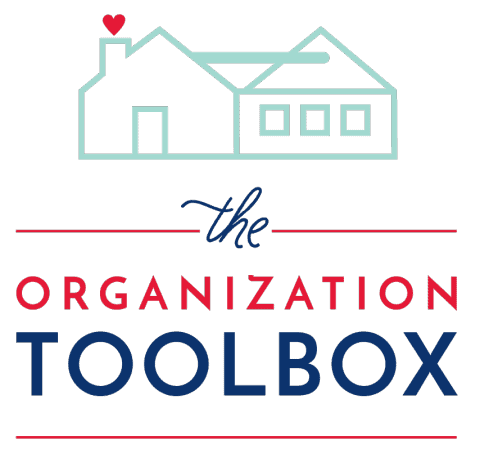 Whether you use mine, someone else’s, or create your own, this is a good first step to creating a tool that will ultimately save you a lot of time and headache in the kitchen! 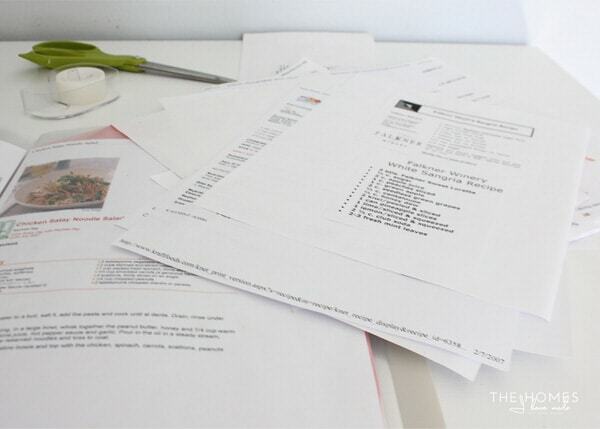 Once you’ve selected and printed out the kitchen/recipe resources you want and need for your binder, the next step is to fill them out and load them into page protectors at the front of your binder (with your recipe inventories). Let me show you what’s in my resource section in a little more detail! If you like to prepare extra meals and keep a decent stock in the freezer, then I recommend printing and using a freezer inventory. Since I like to incorporate meals from our freezer into our weekly meal rotation (usually on Sunday nights so I don’t have to cook at the end of a busy weekend), it’s really helpful to be able to see what I have on-hand as I build my meal plan without having to jump up and dig through the freezer. The key to successfully using a freezer inventory though, is keeping it updated. As you eat up meals, be sure to update the inventory so it accurately reflects what you have on-hand in the freezer. By having the inventory tucked into the resource section of your binder, you can quickly and easily update it by sliding the sheet out and crossing off items as you use them. The entire point of my All-In-One Kitchen Binder is to be able to quickly and easily fill out meal plans and grocery lists for the week. As such, I recommend printing stacks of meal plan and grocery list worksheets and place them in the front of your binder. 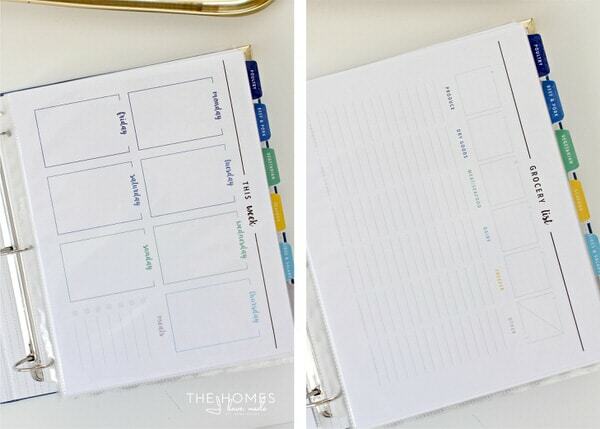 When it’s time to meal plan or hash out a grocery list, you’ll have worksheets ready and waiting instead of needing to run to the computer each time! 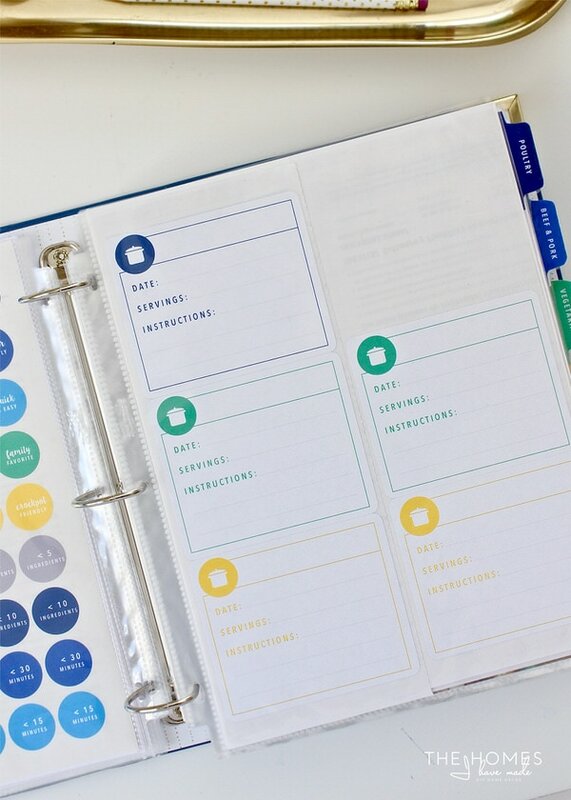 As you regular blog readers know, I like to use pretty and descriptive stickers and labels in my planners and other areas of our home to keep things organized and streamlined. My Kitchen Binder is no different! Having these pre-printed and tucked into the front of my binder means I can quickly and easy add sticker descriptions as we add/try new recipes. The other labels I like to have pre-printed and ready to go are freezer labels. As I mentioned, I like to prepare at least one freezer-friendly meal each week so that I am constantly adding to our freezer stock. To avoid confusion in the freezer and at defrost/prepare time, these stick-on labels allow me to write out all the recipe details in a clear, detailed manner (as I’m originally making the dish) and stick it right to the dish or bag before it heads into the freezer. Having these pre-printed and ready to go means I actually use them, and our freezer meals get labeled appropriately!! The final element in the resource section of my kitchen binder is a kitchen “cheat sheet” of sorts. In a two page spread, I’ve included measurement conversions for liquids, dry ingredients, and herbs as well as at-a-glance conversions to half, third, or duplicate recipes. Being able to flip open to these sheets while I’m cooking takes a lot of the brain power out of meal prep…which is quite helpful at the end of a long day! 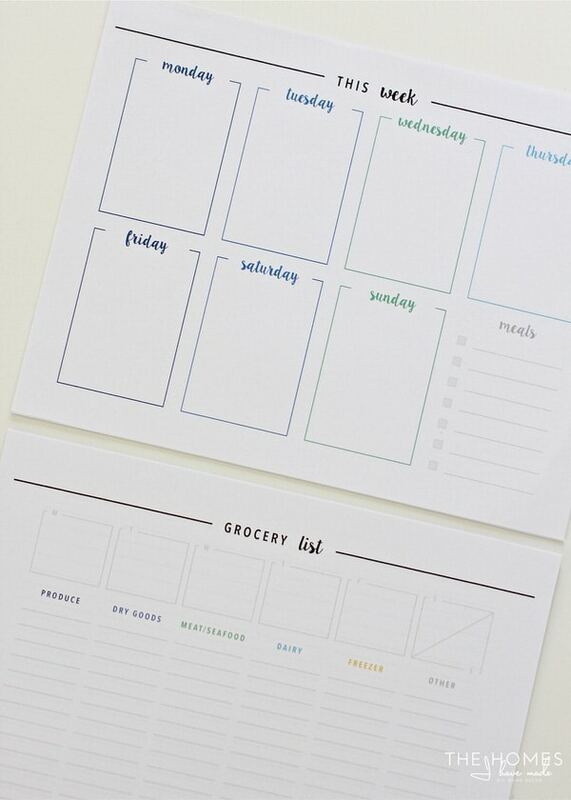 Print these on two separate sheets of cardstock and load into two facing page protectors to make a super helpful spread you can flip to in an instant. These are the printables I’ve included in the resource section of my binder. Feel free to add anything and everything you might need or refer to often in order to make meal planning and prep easy! Step 6. 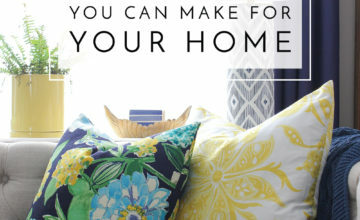 Make It Pretty! The final step is an optional one. 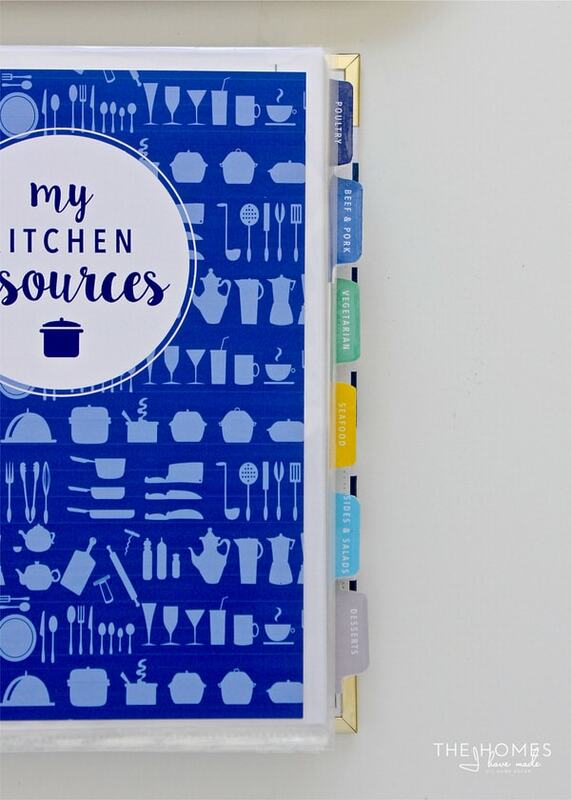 Your All-In-One Kitchen Binder is fully functional by now, but I’ve found I am more likely to use things (and enjoy the process) when there are some little details that make it extra fun and pretty. 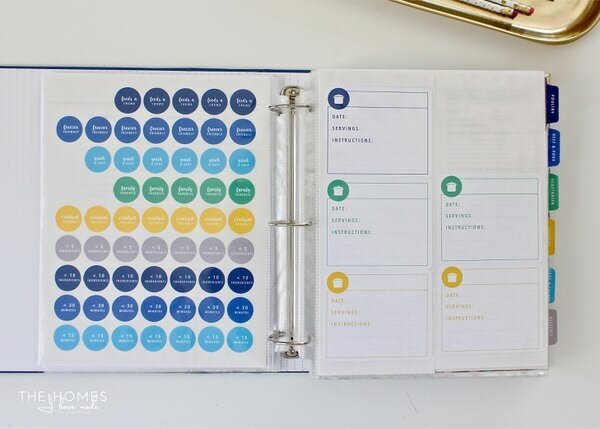 Using all the color-coordinated printables, tabs, stickers and more certainly go a long way in making this binder fun to use, but I’ve also included other elements in this kit that can help you up the cute-factor (if you want it). 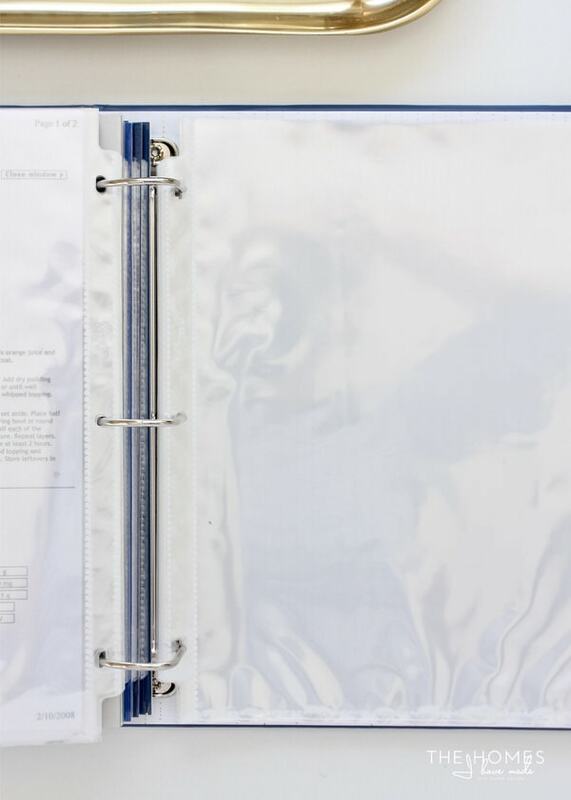 There are 8 different binder covers with coordinating binder spines to choose from, as well as even more dividers and tabs to make your binder as a robust and functional system as you like. 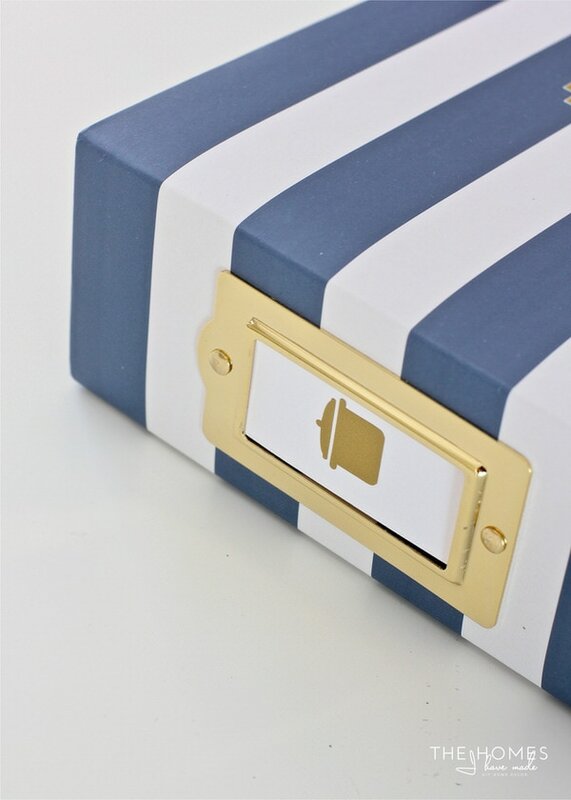 Because I chose to use a binder that already has a decorative front, I simply cut a label from vinyl using my Cricut Explore and secured it right to the front of the binder. 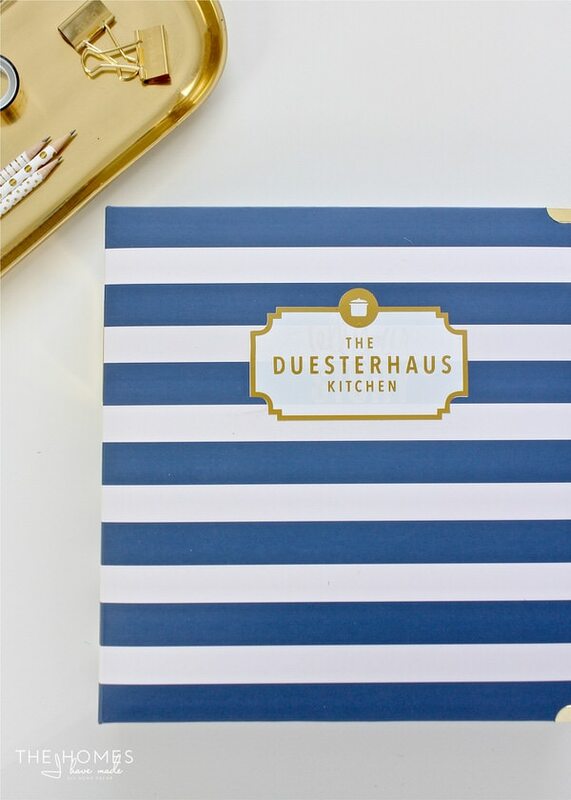 A cute little gold pot on the spine of the binder was the final little detail to finish off our All-In-One Kitchen Binder! 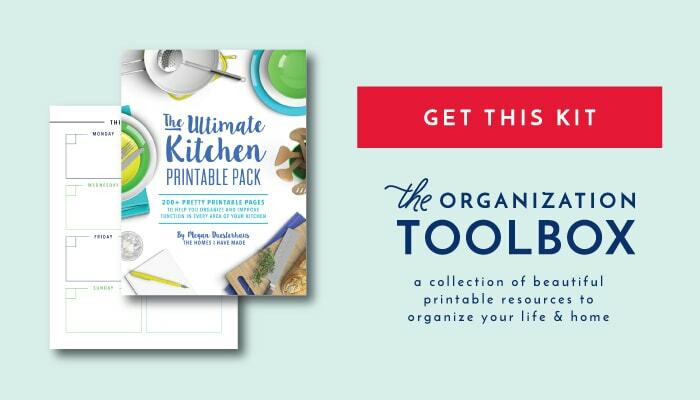 The Ultimate Kitchen Printable Pack has been uploaded to The Organization Toolbox and is available for download right now! 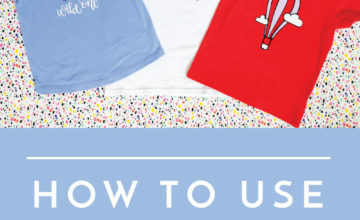 I hope you all enjoyed seeing my printables in action (finally!) 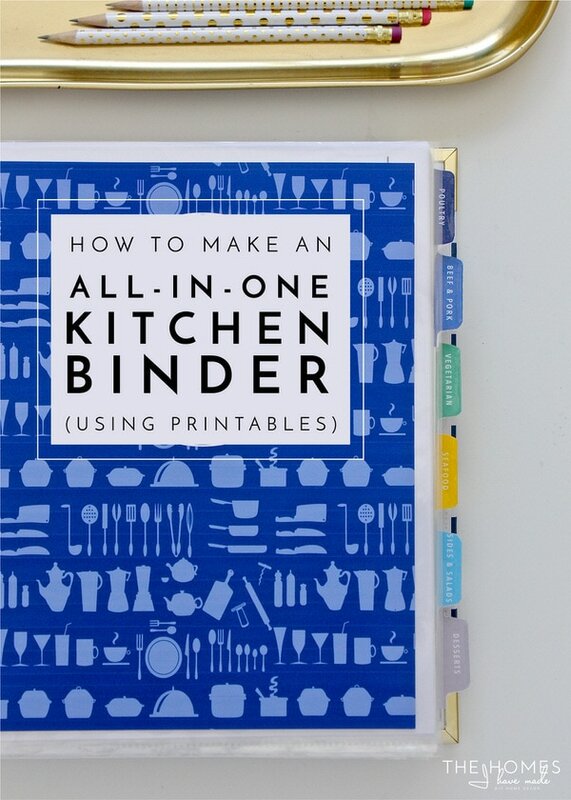 and seeing how (relatively) easy it can be to assemble an All-In-One Kitchen Binder. 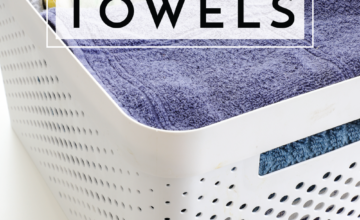 I’ve been using this system now for about 4 months, and I can’t tell you how much I am LOVING the ease and efficiency of having everything at my finger tips. Instead of meal planning and grocery prep being this long chore I dread, I’m able to knock it out on Monday mornings over my oatmeal and cup of coffee. If meal planning has gotten the best of you and you loathe grocery trips as much as I do, give this approach a try! I think you’ll love it! 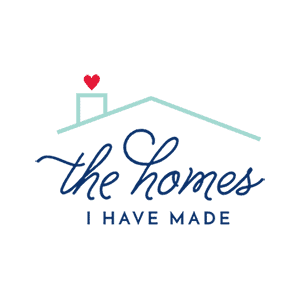 Alright friends…I hope to see you tomorrow at the LIVE workshop. Next week, I’m going to check in with a long overdue Coffee Break and catch you up on all things life. See you then! An Easy Way to Label Chargers and Cords!